The louvred shutter on the VA140 is thermo-electrically operated and is concealed behind the interior grille. Operates automatically when the fan is switched On. 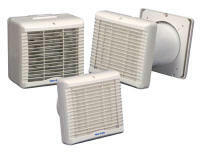 Trickle vent facility available on all models. P models are fitted with an On/Off pullcord which actuates both shutter and fan. Control can be via a remote On/Off switch or through the lighting circuit, as required. Timer models are fitted with an electronic timer which provides the necessary 15 minute overrun time to comply with Building Regulation requirements for internal kitchens or kitchens that do not have an openable window. Adjustable from 3-25 minutes.